Well, it’s almost January, so of course that means it’s time to start thinking about SummerStage again. 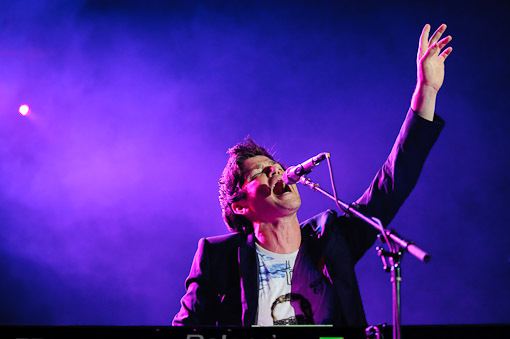 The first unofficially announced show of the 2011 season is The Script on June 4, 2011 at the Rumsey Playfield. The Script’s new album Science and Faith is set to drop in the US on January 18, 2011 on Epic Records. 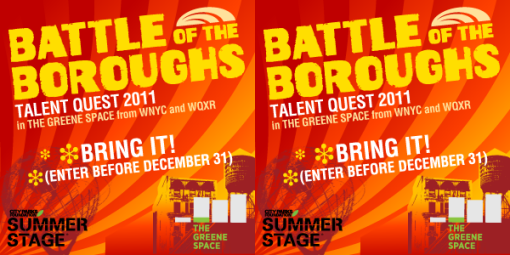 In other Summerstage news, your band could snag an opening act spot in the SummerStage 2011 season and a concert at WNYC’s The Greene Space by winning WNYC’s Battle of the Boroughs Talent Quest 2011. All entries must be received no later than December 31st, 2010 at 11:59 PM. Full details of the Battle of the Boroughs Talent Quest 2011 after the jump. GOT TALENT? The Jerome L. Greene Performance Space at WNYC and WQXR is looking for the best up-and-coming performers in New York City to take part in Season Two of Battle of the Boroughs in. Last year, 45 acts from across the five boroughs performed in The Greene Space and were webcast live to the world. BE HEARD! The Greene Space’s Battle of the Boroughs is open to submissions from bands, ensembles, instrumentalists, vocalists, DJs and spoken word artists. All genres are welcome! A line-up of several acts from each borough will be selected to perform at The Greene Space, culminating in a final round with winners from each borough. The ultimate winner will receive a featured concert in The Greene Space – performing in front of a live studio audience as well as audiences worldwide via a live video webcast – and an opening act slot at a SummerStage concert in 2011! SIGN UP! You can sign up and submit a sample of the work you would like to perform at: http://www.thegreenespace.org/battle. All entries must be received no later than December 31, 2010 at 11:59pm. Summer 2010: Winner’s featured concert in The Greene Space and opening act at City Park Foundation’s SummerStage concert. Previous Post Today Is Free Shipping Day!